Welcome to the 2019 season! 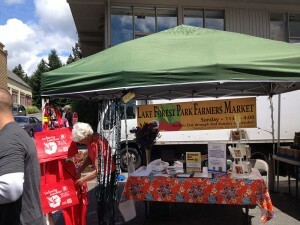 The 2019 Lake Forest Park Farmers Market will open, as always, on Mother’s Day, which is Sunday, May 12th this year. Below is a listing of vendors who participated in the Market last year. Of course, some vendor participation will vary week to week, especially early and late in the season. Follow us on Facebook at Facebook.com/ThirdPlaceCommons for all the latest and greatest market news all season long!